This is not a definitive map of Banburyshire - there were some villages nearly 20 miles away that would consider Banbury to be their market town in the past. 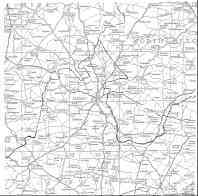 There is an old map from about 1870/80 held at the Centre Of Banbury Studies (COBS): "Stones Map of Banburyshire" and this image appears to have been based on that. Click on the image to enlarge it: it is a relatively large map, so will take a little time to download and you will need to scroll around the page to see all of it. NO, there is not an area recognised on ANY map as "Banburyshire". Its boundaries do not coincide with any political or administrative limits. It is not even all within Oxfordshire, but includes parts of Warwickshire & Northamptonshire as well. ( Buckinghamshire, Berkshire and Gloucestershire are also only a very few miles from our border). YES, Banbury is part of North Oxfordshire, but regarding its folks social history, 'Banburians' probably have more in common with the folks of Coventry, Warwickshire & their local industries & trades -- or the ag.labs/farmers/shoemakers of Northamptonshire, rather than the 'Intellectual' types of Oxford. Many Warwickshire families came through or stayed in Banbury via the Canal system. Many Northamptonshire families came to the town because of its cattle & sheep market. Banbury may be part of the county of Oxfordshire, but Banbury area possesses a distinct identity of its own. One which encompasses all the trades, families, modes of transport, living conditions, social behaviour, education, various religions -- from several counties into one concentrated area. “The town of Banbury is situated at the northern extremity of the county of Oxford, 22 miles from the city of Oxford. It is so near to the county of Northampton that a portion of its outskirts are within the limits of that county: the town of Northampton being 28 miles distant. The county of Warwick, Warwick itself lying at a distance of 20 miles, comprises a considerable portion of what may be termed the Banbury district, and reaches within 3 miles of the borough of Banbury. Portions of Worcestershire and of Gloucestershire are also in much nearer neighbourhood and in much more intimate connection with the town of Banbury than with either of their respective county towns. The county town of Buckingham is distant only 9 miles, while the nearest place in it in which a newspaper is published is distant 34 miles. “The term "BANBURYSHIRE", much used in the 1830's, was not just an affectation, for Banbury's economy was in many respects comparable with that of most county towns. In 1831 some 44,000 people lived within 8 miles of the town, and regarded Banbury as the main focus of their economic activities. Countrymen from further afield sent orders to Banbury tradesmen through their weekly carriers, or annually visited its fairs. The nearest places of comparable size, the county towns of Oxford, Northampton and Warwick, the city of Coventry and the resort of Leamington, lay 20 or more miles away.